A reconstruction of how Brims Caslte might have looked, with thanks to Andrew Spratt. Brims Castle is located about four miles west of Thurso, Caithness, Scotland. There is also a small harbour, or port,(Port of Brims) a headland or spit (Brims Ness) and a small burial ground about half a mile away. It is the second most northerly castle on the British Mainland, with the Castle of Mey, a few miles to the east just beating it as the most northerly. 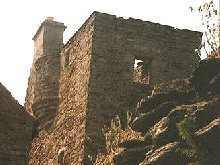 It is now a ruined farmhouse, the castle having been remodeled some time ago. 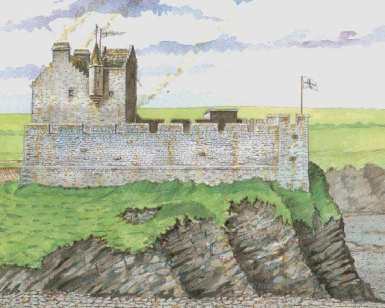 Below are excerpts from several books on Scottish Castles, describing the castle and it's history. See the links page for more resources. Learn about the Begg family who lived there 100 years ago. "..No place in the county has such extraordinary historical associations than this castle..."
Unfortunately Calder neglects to say why! I have tried to discover more history about it but can find no more than William did in 1910. 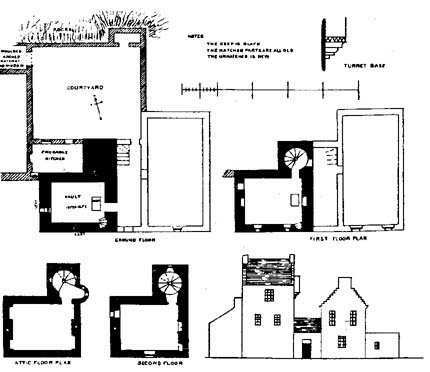 Plan of Brims Castle, with the important keep shown in black. Find more web resources on the links page.